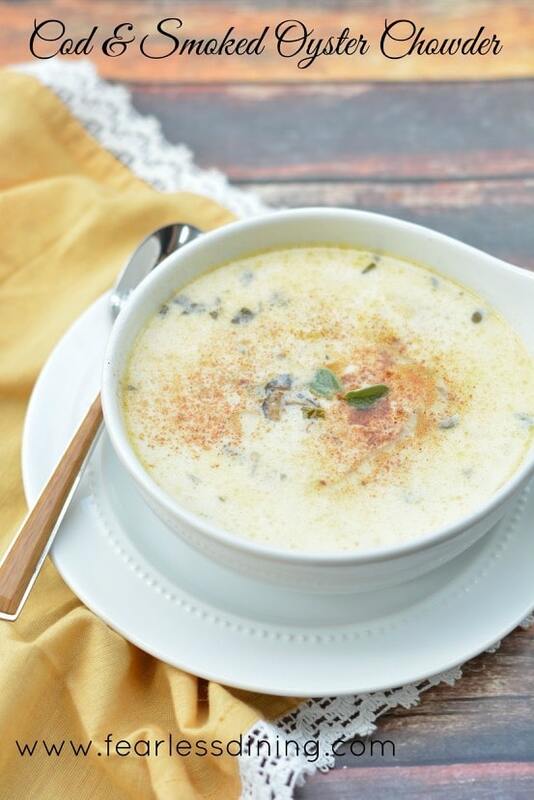 This gluten free smoked oyster chowder is quick and easy to make, and full of rich flavors. 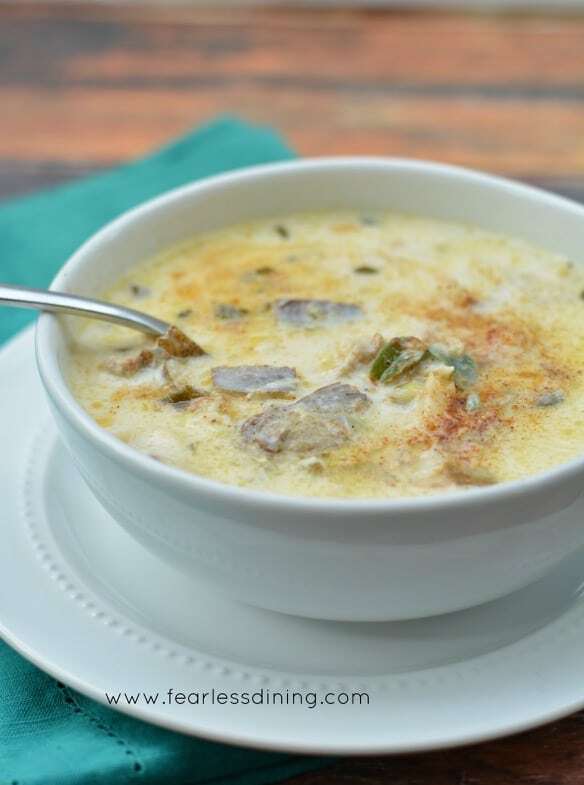 The unexpected smokiness from the smoked oysters adds so much flavor to this creamy chowder. No flour or Roux needed! This homemade chowder is the perfect comfort food for anyone who loves chowder! 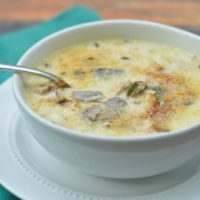 This easy gluten free smoked oyster chowder is absolutely delicious. Creating a chowder without a roux might be easier. Potatoes would add a lot of substance and thickness to this soup…but I wasn’t sure if these potatoes could thicken this soup enough that I could skip the roux. If you have been reading my blog for a while, you will know I love a food chemistry challenge!! This experiment worked!! You will find this is one of the best chowders out there…and it was made in one pot. Nice and easy! The star of this recipe is the smoked oysters. I often wondered what to do with smoked oysters, but this article has so many great ideas. The smoked oysters added a smokey richness to this gluten free chowder recipe that is hard to duplicate. This soup isn’t quite thick enough to be an oyster stew, but with more potato and seafood, it could come close! This soup isn’t quite thick enough to be an oyster stew, but with more potato and seafood, it could come close! And even better, my son LOVED this chowder. This chowder is full of cod, smoked oysters, and potato chunks….and even better, gluten and wheat free! This chowder recipe is made based on New England Clam Chowder. I love the milky creaminess of these types of chowders. New England chowders have a heavy cream base. You can also find chowders based on Manhattan Chowders. This type of chowder has a tomato base. Red Potatoes – If you don’t have brown potatoes on hand, no biggie! You can replace them with red potatoes, and every bite will be just as scrumptious! Mushrooms – If you are a fan of mushrooms, you should add in a few! They give an earthy flavor to the dish that can’t be beaten. Onions – Can’t live without onions? Add some in this chowder and gobble up a bowl of hot soup. Bacon – Seriously, everything is better when you add some salty bacon! Spinach – Spinach is a perfect ingredient to add in so you can have some extra nutrients. Bonus points if your kids and spouse don’t notice! You can also use my roux free recipe to create a seafood chowder. Just use your favorite seafood! You can eat oysters right out of the can! You don’t have to heat them up or anything. 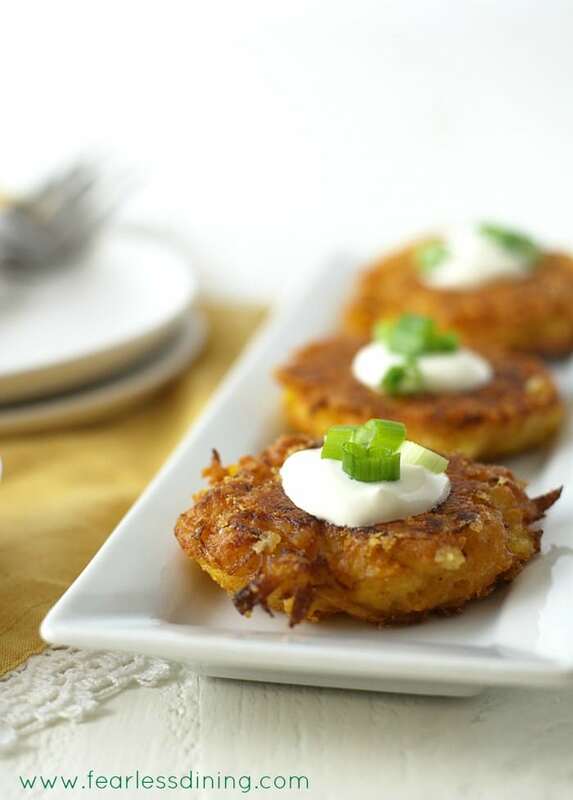 Serve them with some gluten free crackers and your taste buds will thank you! A can of smoked oysters has a shelf life of 3-5 years! If you want to stockpile healthy food, this is one to add to your list. And if you are in California, smoked oysters are a great idea for those earthquake supply kits! Smoked oysters are keto friendly, gluten free and paleo! So you can enjoy this guilt-free pleasure whenever you like! How Do You Store Leftover Oyster Soup? Store any leftover oyster soup in an airtight glass container. The oyster chowder will last around 2 days in the fridge. If you notice an abnormally fishy odor or it becomes slimy, then it is time to throw it out. To reheat the oyster soup, warm it up on the stove in a pot stirring occasionally. Heat it on low heat so it doesn’t burn. It should be warm in 10-15 minutes. 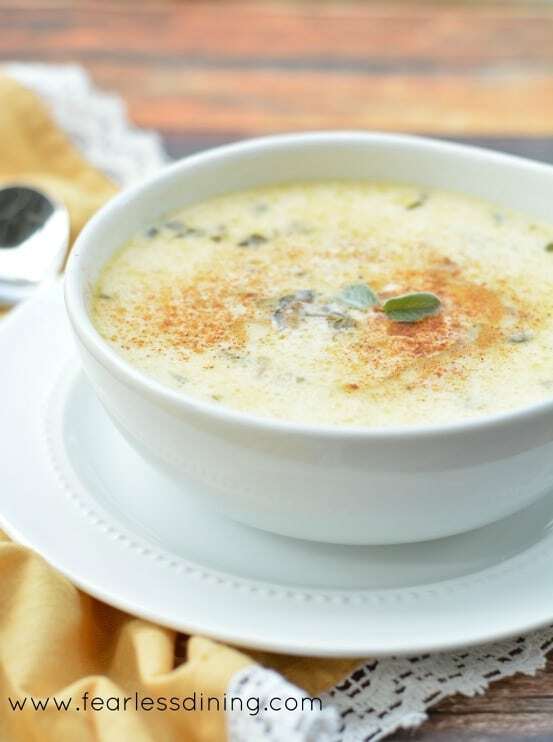 Can You Freeze Oyster Chowder? Technically, yes you can freeze oyster chowder. I don’t really recommend it because the texture of the potatoes will not be very good once you reheat the chowder. You can always give it a try and see if you like it, but typically I don’t care for reheated potatoes after they have been frozen. This chopper helps get those potatoes chopped in no time. Easy creamy roux free seafood chowder recipe. In a large pot, brown leeks in oil for 4 minutes. Cover and bring to a boil and cook for 10 minutes until cod is cooked. Add potatoes, oysters, paprika, sage, miso, salt, pepper, and milk. Stir occasionally to prevent sticking to bottom of the pot. Thanks for all the tips on making a great chowder! I have to admit I’ve never made one! We love soup and one of my favorites is a good chowder. I would take that before anything else. Your chowder looks fantastic — I’d love to dive right into it. Dive away Marisa :-). Thank you so much! I looooove chowders, including any and all types of seafood chowders. This sounds amazing with the oysters! Glad your experiment worked so well! Yum! I don’t know how I missed this one; it literally caused my stomach to growl and it’s not even noon here yet. I love seafood chowders and yours looks sublime. I’m also interested in knowing if you would be interested in a temporary son exchange; I so wish we could get our kids to eat this! Great job, once again. My son would love to come 🙂 He is easy…my daughter is the difficult picky eater. Not sure if it ever gets better, she has been like that her whole life. Oysters are delicious, but I find them hard to incorporate into meals, since they have such a pungent taste. This cod and smoked oyster chowder recipe you shared may be a great way to begin eating clams more. Cod has a light taste, so combined with the oyster, it will be delicious. Thank you for sharing a great and inspiring recipe with those of us who live off of others food recipes for yummy meals. I am missing soups, we haven’t had a homemade one forever, this looks so good! Doesn’t make you feel so happy and proud when a recipe you’ve been trying to create eventually is a success? It does to me! This is a great chowder and I am sure my family would love it too! Sage and paprika, how divine! What wonderful flavor additions to this soup, which looks so hearty and creamy and wonderful. This is a great chowder recipe. I have never tasted chowder before, except the vegetarian versions. You make amazing looking recipes and you have great eye for styling. What a great feeling when a recipe works just the way you want it to! Your chowder looks delicious! I love seafood chowders, this sounds delicious, plus I love that it is made all in one pot, how easy! I’m so glad you figured it out, what an accomplishment, it looks beautiful. I’m not that familiar w/ smoked oysters but I’m interested to try. We love chowders, I’ll have to try adding smoked oysters one of these times. Thanks! The smoked oysters definitely add a fun smokey flavor to the chowder. Ok…. I am in love with this recipe. I don’t make chowder enough. This looks so mouthwatering – great pictures! Def. making! You are the GF wizard. This chowder is fantastic. That is a great question Jules. I would think coconut milk because it is creamier…but you may need to adjust the seasonings so the coconut doesn’t over power the chowder. I love a good chowder, and this one looks fantastic! Thanks for sharing on Try a Bite Tuesday! Hope to see you back next week! I love making chowder in the summer. As a New Englander, summer is all about the chowder and fresh seafood! Thank you Sharon…I grew up in New England and I remember driving up to Maine to eat chowder. This looks delicious! So happy to hear that your recipe was a success! Pinned! Love a good chowder and this one looks great! Glad this worked out for you. It sounds delicious.